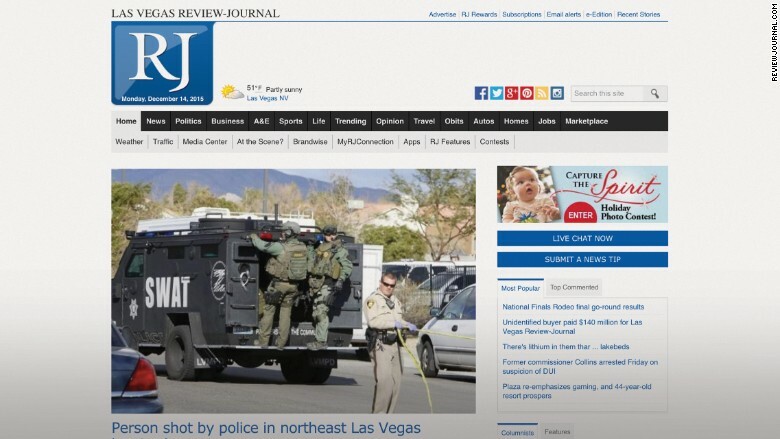 Add Jeb Bush to the growing list of people who want to know who owns the Las Vegas Review-Journal. On Monday Bush visited the newspaper's office for a meeting with the editorial board, a common practice for presidential candidates. Afterward he tweeted that the only question "left unanswered" at the meeting was "who owns the newspaper?" The paper was purchased for $140 million last week. The firm that bought it, News + Media Capital Group LLC, apparently consists of multiple investors, some of whom are from Las Vegas. But none of the new owners have been identified. Staffers at the daily paper -- the largest in Nevada -- are disturbed by the secrecy. So are some outside observers. Over the weekend several media experts said they could not recall a similar circumstance involving a major paper in recent decades. Earlier: Who bought the Review-Journal and why? Around lunchtime on Monday, at least two dozen reporters and editors staged a Twitter protest of sorts. They simultaneously tweeted a link to the Society of Professional Journalists' Code of Ethics, which calls on journalists to "be accountable and transparent." The implicit point is that the newspaper can't be held accountable if readers don't know who is controlling it. Several of the paper's reporters highlighted this passage from the code of ethics: "Abide by the same high standards they expect of others." And Review-Journal columnist John L. Smith tweeted that many in the newsroom are "rightfully asking, 'Are you my owner?'" Free Press, a left-leaning media watchdog group based in Washington, also called for the new owners to "come forward and identify themselves." "Not knowing who owns the paper they work for diminishes the ability of Review-Journal reporters to identify potential conflicts of interest in their work," said Fiona Morgan, the group's journalism program director. "This lack of transparency also undermines the public's trust, which is the foundation of good journalism," Morgan said. She asserted that it is in the paper's financial interest to disclose the new ownership structure: "Newspapers need their communities' trust to survive. The secrecy cloaking the Review-Journal's new owners has created unnecessary uncertainty at the paper."